By Skezza, May 23, 2013 in The Archive - "How to" and "Information"
I've been meaning to chuck this together for a while. Currently, the information regarding fitting it is a bit all over the place and broken, so using photos that I took and information from the forum I've put together this fairly comprehensive walkthrough of how to fit Remote Central Locking. Before starting, you already need central locking as standard. So pov specs are out of luck. Fitting remote central locking is very easy, even for a novice, but you need to be willing to remove trim and mess with wiring. It's not plug and play, but it's not far off. For an expert it would take less than an hour. For a VW expert, it would probably take 20 minutes! For a total novice it will likely take about 2-4 hours, so leave yourself a bit of time to do it. These steps are fairly inter-changeable so just use them as a guide rather than a strict tutorial. e.g. if you want to save the trouble, you can happily snip the cables from the RCL wiring loom BEFORE fitting it. I just wrote the guide from memory in order of the way I did it. You need a kit to begin with. They are also pretty expensive considering you're paying a premium for a flashy key. RightClick sell the exact same kit for £26.95. All you get extra is an activity LED + a pretty instruction manual. You may as well save your money. If you want classy you could go for a Hawk Car Alarm's kit which has carbon fibre remotes and most of which support optional extras such as proximity alarms etc and such. I won't be covering that kit, so I won't place the link however if you do want to go for this kit, you might want to use this as a loose guide for fitting it. Depending on the kit you chose, the box should contain one receiver box, two remotes, one wiring loom, a sticky back pad, (Optional) an LED indicator (Optional) and a instruction manual. I suggest purchasing some earth ring terminals if possible (an assorted bag would be ideal as I have forgotten the size of the screw thread you will be using to earth), if not, a decent fork connector is enough which is what I used. If you do decide to use earth terminals, you may want a few of them as you can do each wire individually rather than grouping. If you use a fork, you probably will only want one as they are a nightmare to get hooked so like me will group. A roll of electrical tape will be useful for keeping wires bundled together, a crimp tool if you need to extend the wire... and of course you may need some extra wire to go along with that. I found that two wires requiring earth were far too short, so I extended them using spade connectors + heat shrink for neatness. You can do this however you want. 1. The first thing you will want to do is remove the relevant trim. The easiest piece to get you going is the trim above the pedals, which is held in by two Torx screws. This might be a good opportunity to scout yourself out a good position for the receiver box, just because you'll have lots of wires in the footwell later on. While the general recommendation is as high as possible, I've not had any reception issues so far with it down above the pedals. When you find a nice spot, make sure your pedals can be pressed without the box interfering. Mine is located slightly behind the white grid on a flat surface, out of the way of the pedals. I hope to add a photo of this a.s.a.p. Don't secure it just yet, remember the spot though. 2. Now you need to remove the bonnet release handle and trim. There really is no photo that can explain the removal of the bonnet release handle, it's a bugger, but the way I found best was to pull the handle (opening the bonnet in the process) and then using a flat head screwdriver as a lever inside the gap holding in the piece towards the rear of the handle. 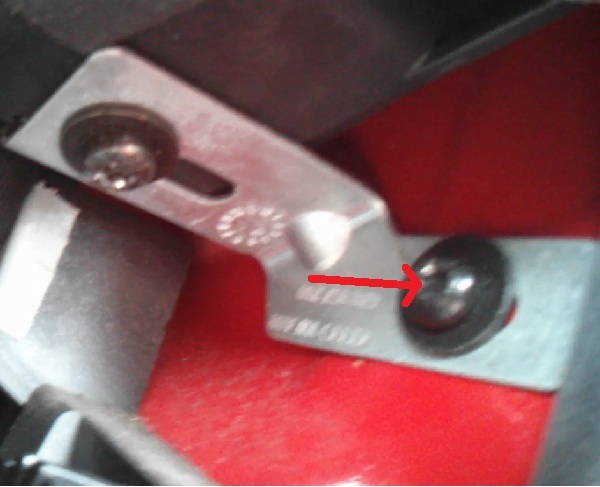 If you look at the photo below, the piece to the right is held in to the bonnet release. You can flick this off, the bonnet release will come off. Unscrew the screw behind and remove the trim. It is a bit awkward, but it will come with a bit of effort. 4. Grab your wiring loom, make sure none of the wires are tangled. Now your kit may differ, but assuming you went for an RClick, or a Universal Kit from eBay like the one I did, the colour codes for the wires should be identical so you can follow those below. If not, make sure you check your instruction manual or wiring diagram. Splice these connections using your respective method. Soldering, military splice or bullet/spade connections are ideal. If you use spade connections use heatshrink!!!! Try and ensure the inline spliced wires are facing upwards so not to introduce a kink, which can reduce the lifetime of the connection. 5. Once that is complete leave the loom in the footwell. Secure the receiver box wherever you decided earlier (I bet you didn't). I suggest doing this now as you may need to extend two wires on the loom in the next step. If you would prefer to place the box later, you can go straight to step 6/7. Mine is placed just behind the white grid on a small flat section. Make sure it does not interfere with the pedals. Secure it using the sticky tape, or alternatively blu-tac. I used blu-tac as it's reusable and I may purchase a programmable key (NOT FLIP) in the future and remote learning requires access to the box. The photo below demonstrates where approximately where mine is located, although you can't see it as the photo was taken before I fitted it properly. I'll take one of the box properly fitted a.s.a.p. 6. At this point, it would be a good idea to re-plug the brown and blue connectors back in and check whether it actually works. You don't want to be left red faced when it doesn't. Assuming it works and you don't intend to wire in the indicators, now you just need to route the wiring. Unplug the wiring loom from the receiver box. It is far easier to route this way. I suggest snipping all the wires that aren't being used as they can get a bit out of control as you can see in the photo above (right at the start of the guide). I snipped all of the coiled wires except the green one as that is the window rollup. If you snip them roughly 3 inches from the plug, you can easily re-attach them later using a bullet or spade connector, something I will do if I wire in the indicators. If you want to wire the indicators now, do not snip the brown wires on the loom. Go to the bottom under the section Indicators for explanation of how. 7. To route the wiring loom, I suggest bundling the remaining wires together using electrical tape and then taping the bunch down next to the panel. To be fair, you will be on your own a bit here because I imagine each person will locate the box slightly differently. Just do it logically. Don't be silly, make sure it is nowhere near the pedals, and don't drape it across the piece of trim you removed earlier. If you do, you (or your mechanic) will be irritated next time you remove it... e.g. replacing a brake light switch if it fails. Be generous with the electrical tape, so the wires are nicely bundled and secured. 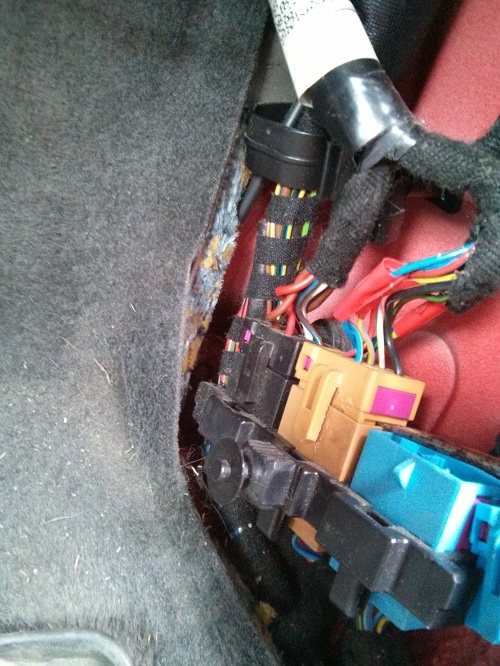 It might look messy but how often are you going to access that wiring behind the bonnet handle? I taped the wire bundle to the nearside panel so they don't move then ensured the routing was consistent up to where the box was located. This wasn't hard but I probably spent about 10-20 minutes to make sure it was perfect. Plug the loom back into the box and test it one last time. Do a quick spot check to make sure your earth is strong, your wiring is safe and there is no chance of it catching the pedals. Ensure the brown and blue plugs are safely seated. They are designed to vibrate, but will shuffle out if they are not securely locked into the socket. 8. Re-attach the the relevant trim. The trim behind the bonnet release handle is kind of awkward, but you will just need to feed the clips using a bit of twisting and what not. You'll get it, just be patient. The bonnet release handle is really easy, as you simply place it in the correct position then feed the locking clip back into the open hole. Take the panel above the pedals and push it back where it came from. It should clip in, although the clips aren't really suitable for anything other than temporary grips while you re-screw it. 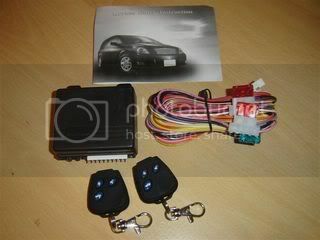 There are two methods of wiring in the indicators so they flash. On the RCL wiring loom, the indicator flashers are the brown wires. As I've done neither thus far, I cannot add any photos here. The most common method is to simply remove the steering column and splice into the White/Black and Green/Black wires which are both indicators respectively. If I do decide to do this, I will upload photos later. Alternatively, Pete91's method is to wire them into the hazard warning switch. Video of my value kit installed. Any questions, just PM me. Great right up mate! Been a long time coming, very clear and concise. Just what we need. I'd like to add that fitting the RClick kit to a non CL car (pov spec) is even easier! You just need constant 12v+, earth, indicators (optional) and to then route the wiring for the actuators through the doors and then drill 2 holes to mount the actuators. No need to tap into looms as they won't be there! I found when wiring indicators it was easier to go straight to the steering column and splice into the green/black white/black wires, RClick kit is great value, I would recommend it.